50 Days Of Vape - E-Juice Reviews: 'Mint Toffee' Created by David Mallick. 'Mint Toffee' Created by David Mallick. This is a written review of 'Mint Toffee' and my opinion of this juice will be my true and honest opinion as always. The juice I am reviewing is 24mg 50pg/50vg. I am using a dripper at 2.1 ohms on my Evic set at 9 watts. On opening the bottle, I could smell the aroma of fresh cool mint. Chilling my senses and awakening my spirit. A mint so appealing, the aroma was Simply Irresistible! On the inhale, a sweet peppermint, creamy and delightful, reminding me of a cold wintry day, looking out of the window, watching the falling snow. With its fresh mint scent, reminding me of candy canes hanging on the Christmas tree, bringing back fond memories of christmas past. A true christmas tradition in my family!, and a memory, I will cherish forever. On the exhale, the rich, buttery flavour of sweet toffee, and a smattering of fresh, cooling Peppermint, simply took my breath away! This mint toffee acts as a bridge for me. A bridge in many different ways. It is a bridge to making me feel comforted, so decadent and so good, you'll certainly want more! It is a bridge to friends and family, by sharing these wonderful flavours together, and enjoying the same pleasures as I have. It is a bridge to making everyone out there, know exactly what this juice is like, by letting them sample the wonderful flavours for themselves. I have always had a bit of a sweet tooth. That means I have eaten a lot of sweets over the years. 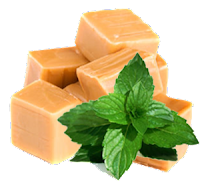 I have sampled many rich mint toffees from across the globe and it has taken me until now, to find the most realistic mint toffee in a vape that I can truly say deserves it's recognition. It is beautifully sweet, but not overly sweet. It is rich and creamy, Cool and provocatively pleasing, with both flavours blending together perfectly with just the right amount of sweetness. David has perfected this recipe, for us to enjoy, and I am pleased I had the privilege of sampling it's goodness. With the setup I was using, the flavour was very enjoyable, the throat hit was perfect, and the vapour production was immense. This is a juice I would most certainly, vape all day.